Blackhall Athletic’s drab first half performance layed the foundations for a 4-1 defeat away to Earlston Rhymers. The visitors had significant absentees, namely Zane Ewart and Thomas Hedges, which meant Calvin Catala stepped in at centre back, and Nathan Gallagher partnered Brandon upfront. Jamie Campbell was again named captain after showing his impressive leadership qualities the previous week. Blackhall took the game to Earlston in the opening few minutes, and won a free kick which came to nothing, before some good football from Alex Shanks also had no impact. The away side won a corner after Nathan Gallagher’s cross was blocked, but the ball in failed to beat the first man and it was sent out for another corner. The corner came in but it was again easily dealt with. Nathan Pearse finally delivered an inviting cross, but before anyone could get their head on it the ball was hammered to safety. Earlston had no chance to counter attack thanks to Jamie Campbell who won the ball marvellously and then dispossessed his man again. Gaps were beginning to be found in the Blackhall defence, who were playing a very high line. Earlston number 8 Lewis Anderson found himself with acres of space in the midfield, he then played in number 9 Alisdair Buchanan who initially got past Calvin, but the centre back recovered well and gave the ball to Jamie Campbell, who was pressed well and forced into giving away a free kick. The free kick was fired into the box and met by number 7 Fraser Falconer who scuffed his initial shot, but slammed home the rebound to give Earlston a 1-0 lead. Jamie was then smashed in the face by the ball, meaning he would unfortunately have to be taken off after a really lively performance. Khadime came on for the captain and Fallilou was also brought on for Alex Shanks. The home side could have had another goal when number 11 Alex Ainslie was put clean through, but Finn ran out to smother the ball and stop Earlston from doubling their lead. 1-0 did become 2-0 when Khadime put in a weak challenge, allowing Lewis Anderson to skip past him and thread through Alisdair Buchanan who met the pass well, and hammered his shot beyond Finn in goals to give his side a two goal cushion. Alisdair was bearing down on goal again, but his shot was poor and dragged wide of the goal. Blackhall registered a rare opportunity when Brandon shifted the ball onto his left foot, then placed his shot just wide of the mark. Calvin then picked the ball up twenty yards out, and unleashed an attempt which was straight down the keeper’s throat. Number 16 Jack Bell was the next Earlston player to exploit the gaping holes in the Blackhall midfield, when he picked the ball up completely unchallenged, took it forward, danced beyond the one man coming to challenge him, then shot from outside the box and was unlucky to see it go wide. Substitutions were made by Blackhall, with Jamie coming back on for Khadime, and Andrew Jack replacing Dugald, which meant that Michael would move into the left wing position, and Andrew into left back. Earlston put the game out of Blackhall’s reach after forty minutes when the centre backs were undone by a simple long ball, which paved the way for Alisdair to get past the defence and coolly slot it home to make it 3-0. Lewis Anderson then tried a speculative effort from the edge of the box, which forced a fantastic save out Finn who flew through the air to palm it to safety. Unlike Blackhall, Earlston made their corner count when Alex Ainslie rose above everyone and easily headed home to put the hosts 4-0 up, and put the game to bed. Blackhall did manage to pull one back right before half time, when Nathan Gallagher fizzed in a tantalising cross which was met brilliantly by the head of Michael to make it 4-1 at the break. Dugald was brought on for Fallilou at the beginning of the second half, which pushed Nathan Pearse to right wing, and Dugald into right back. Earlston had chances right from the off, when Fraser Falconer forced a save out of Finn, who was then dispossessed but the ball was cleared away just in time. Jamie Campbell then showed real desire to get to the ball, and was rewarded for this by winning a free kick. From the free kick Nathan Gallagher flicked the ball over one man but the goalkeeper Finlay Dodds bravely came out to collect it. Brandon then had to come off after he landed awkwardly, meaning he was replaced by Craig Stewart. Earlston could have been further ahead when number 5 Adam Davison found himself in space, but his effort was comfortably caught by Finn. Michael was the latest Blackhall player to get injured, so he was brought off for Fallilou. Earlston were then gifted a free kick after Dugald sliced through his man, leaving him in a heap in the floor. From the free kick Fallilou intercepted, then raced forward with the ball and found Nathan Gallagher who subsequently compelled the keeper into an astounding stop. This would be Nathan’s last action in the game, as he was brought off for Brandon, who had recovered from his earlier fall. Blackhall had another chance when a great cross from Craig was headed to Andrew Jack on the edge of the box, unfortunately the Blackhall number 5 put no direction on his shot, and it was easy for the keeper to save. Brandon’s shot from distance was then saved well by Finlay Dodds in goals. The game opened up even more in the closing stages, Fraser Falconer put a great ball into the box, but number 9 Alisdair skewed his header over. Craig Stewart was then handed a guilt edged opportunity when he was expertly played through by Jamie, but he blasted his shot miles over. Shortly after, Craig was found brilliantly by Khadime’s floated ball in, but he fluffed his lines again and his strike flew over the bar in the final minute of the game. Full Time. 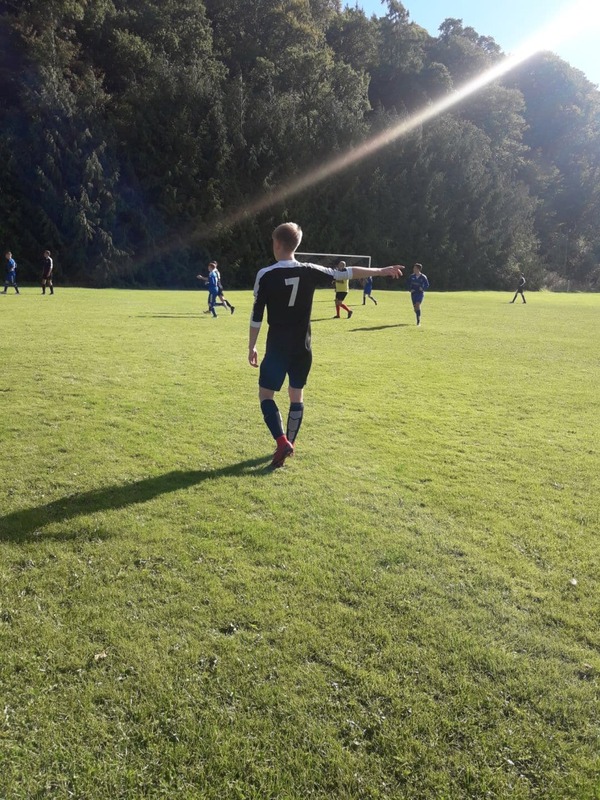 Earlston Rhymers FC 4 – 1 Blackhall Athletic.